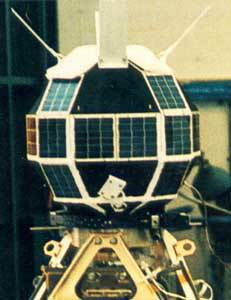 GLOMR (Global Low Orbiting Message Relay), was a DARPA mission designed to demonstrate the ability to read out, store, and forward data from remote ground-based sensors. The spacecraft was built by Defense Systems Inc. (DSI) and Riockwell and conssited of a small, 62-sided polyhedron without stabilisation. Design included redundant transmitters, receivers, batteries, and battery charge control systems. It had two CMOS microprocessors - one for communications control, the other for scheduling, mass memory, housekeeping, and mission control, telemetry, and command functions. The satellite was first scheduled for deployment from Shuttle mission STS-51B, but a battery problem forced a return to Earth for repair. Reflown and deployed from Shuttle mission STS-61A, the vehicle finally re-entered after 14 months. The total price was less than 1 million dollars. An improved version was launched as SECS (TERCEL).